« Eating Breakfast – Is it Really the Most Important Meal of the Day? I am a big fan of Time Magazine. I’ve been reading it for decades now…oops, I am devulging how old I am here…tse, tse. I thought I should bring your attention to this superb article in the latest edition ( you can read it online too, at least most of it, just click here to read the How to Live 100 Years online from Time Magazine). Jon Benson is an expert and he has different programs online and a great forum for those who want to take action and live a healthier life. If you want to check out his website and diet plans,which by the way are very affordable and all have a money back quarantee then click here. Anyway, here are some quick exerpts from the article that really caught my attention. “Only about 30% of aging for most people is genetically based, which means that the other variables are in our hands”. Great News!, as far as I am concerned. I really don’t know where I stand genetically since I might have excellent genes if I inhereted them from my mother’s side or really scary, crappy ones if I inherited them from my father’s side. You see, my mother is 76, healthy (well, no major issues just some arthirities), she is in good spirits, always smiling and joking and get this, she still smokes a pack a day….. Now my father on the other hand has been dead for alomost a decade, had several health problems starting from heart attack to diabetes to liver issues…go figure. They ate the same food, lived in the same environment and pretty much not exercised. Talk about overfed. I don’t think most of us realize that we truly are overfeeding ourselves. You know it didn’t happen overnight. By having an over-abundance of cheap (and crappy) food available ready to eat all the time, what do we do? We eat all the time. Why? I am sure everybody has their own reasons but most of us don’t analyze it, we just do it. Many of us are starting to realize that we are not doing ourselves any favors by overeating so we try and watch it and go on these crazy diets that screw us even more. What’s worse then we stress about what we eat. There you go: we have added more stress to our lives now and we are not even losing weight (or at least not permanently) so what the heck is going on? There is hope! The key to me is to be aware and to constantly educate ourselves. Having a support group, a forum, where one can ask questions from experts and also share information and frustration with others is also great help. 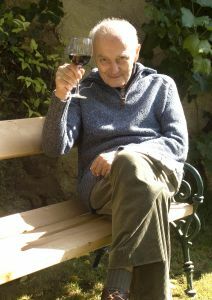 I have read and written a lot of articles about Healthy Aging at http://www.ezinearticles.com. What you are saying is so true. Supercentenarians, people who have lived way past 100, seem to share certain common factors. They tend to have worked and even continue to work, sometimes hard labor, they eat small meals, have close friends and family, have a spiritual belief that sustains them, have an optimistic, happy disposition. They don’t necessarily do exercise as we know it (going to a gym, lifting weights0 but they are activie – not sedentary. If you are not familiar with the Blue Zones – read about it. Great comments ladies and ones which strike a chord with me. At 61 years of age I’ve never been one to carry out regular predetermined exercise and do so in a natural way by walking which I enjoy immensely. Being a bachelor I prepare all my own food and stay within self imposed guidelines as to what I eat and when. As far genetics are concerned my father died when he was 90 but I put a lot of that longevity down to the healthy diet my dear old Mum enforced on all of us as kids and which sustained my father until he was ready to go. Incidentally, my dear old Mum turns 93 next month and doesn’t look even close to her age. As far as she’s concerned she’s not going anywhere just yet!